Make Your Way To The Mt Cannibal Community & District Family Fun Day Next Weekend! Sausage sizzle, raffle & more! The Mount Cannibal and District Preservation Group are hosting their greatly anticipated inaugural Mount Cannibal Community and District Family Fun Day and Gumbuya World on Sunday, April 14! Set on 45 acres of manicured gardens and bush, you'll be able to experience the park's four amazing worlds of fun & adventure while taking the opportunity to catch up with neighbours and friends. President of MCADPG David Bywater said the day was a great chance for the community to come together after the devastation of the Bunyip State Forest fires. “We are all blessed to live in an area of natural beauty and environmental peace and we delight in our good fortune,” he said. “Attending the Family Fun Day at Gumbuya World is an opportunity to get together and celebrate this special place. “The community has been badly affected by the recent fires and all residents are standing together to help each other through this difficult time. 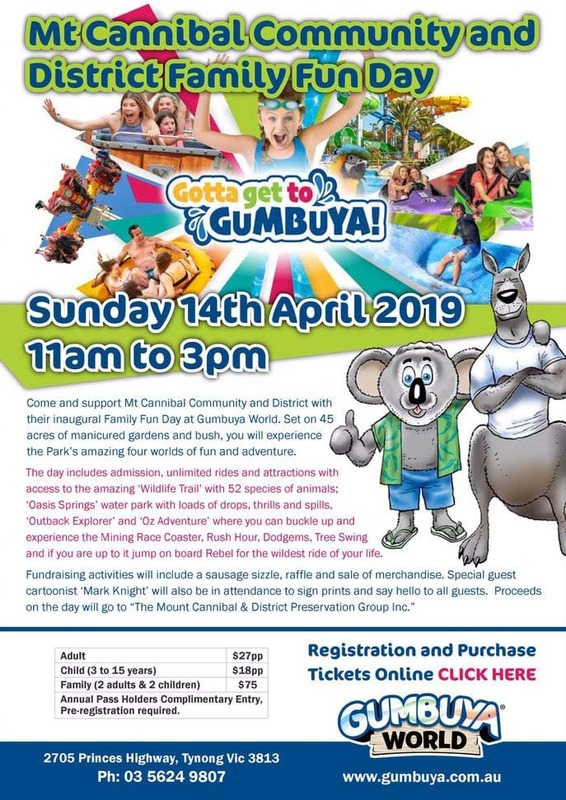 “I would like to invite everyone to join with us on the Family Fun Day at Gumbuya World, as this event will provide a further opportunity to demonstrate our community spirit and continue in offering valuable ongoing support to all residents. “In addition, it will allow for the expression of our thanks to the CFA, police, the Cardinia Shire, all the volunteers who manned and continue to man the recovery centers, and all other support groups who have assisted the community." The event, which will run from 11am to 3pm, will also be a chance for local environmental groups and MCADPG to raise funds and highlight the beauty of the surrounding area, including the popular Mount Cannibal, which sits just over two kilometers from the park. “We are extremely lucky to be located next to Mt Cannibal and believe Gumbuya is the meeting place for its community to have family fun for generation to come now that’s worth celebrating!” Gumbuya World Business Director Ron Weinzierl said. Fundraising activities will include a sausage sizzle, raffle and sale of merchandise. Special guest cartoonist Mark Knight will also be in attendance to sign prints and say hello to all guests. ‘Oasis Springs’ water park (that has loads of drops, thrills and spills), the ‘Outback Explorer’ and ‘Oz Adventure,’ where visitors can buckle up and experience the Mining Race Coaster, Rush Hour, Dodgems and Tree Swing.